As the author of The New Case for Gold, I receive frequent invitations to speak at precious metals conferences around the world. I enjoy doing these events because I like meeting people and I learn a lot by interacting with the attendees. Lately, the event sponsors have insisted that my participation include some comment or panel participation about bitcoin. I don’t blame the sponsors. The audiences are clamoring for information about bitcoin and it’s up to the speakers to provide that information. These sessions sooner or later evolve into a “gold vs. bitcoin” debate. I consider that a phony topic because gold and bitcoin don’t have much in common and are not good substitutes as money in the same way that silver can substitute for gold or euros can substitute for dollars. Still, the topic is in demand and I give it my best shot. 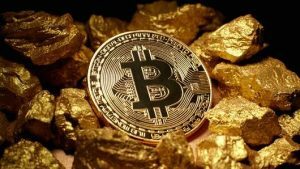 One of the myths that has risen up around this debate is that demand for bitcoin is siphoning demand away from gold. As this article shows, there’s very little evidence for that. Gold demand may be in the doldrums in the U.S. even as it’s red-hot in Russia and China, but that has nothing to do with bitcoin. The bitcoin buyers are from countries with collapsing currencies such as Venezuela or war zones such as Syria where small investors don’t have any ability to invest in gold outside the home country. Other bitcoin demand comes from millennials in the U.S., Japan, South Korea and Europe who consider it a safe store of value. These millennials grew up playing video games with virtual currencies and have come of age since the panic of 2008. They’ve never seen what a real market panic looks like (I’ve seen many in my career, including 1974, 1980, 1987, 1994, 1997-98, 2000 and 2007–08). The millennials will find out soon enough how a panic feels and we’ll all find out how bitcoin performs in a panic. In the meantime, click here for a great reminder that bitcoin is not a threat to gold and global demand for gold remains strong.